On the prowl for some grouper? This fish lives in deep waters and is typically difficult to catch. However, with the proper info and a few angler tips, you’ll be able to score your big catch with ease! Grouper fish are gray, and they usually have brownish patterns on their bodies. These patterns often change color to help camouflage them based on the environment. They can grow quite large with the gag grouper sometimes growing as large as 50-100 pounds. They do have restrictions on what you can keep. Depending on the species, they need to be at least 20 inches to keep. Groupers like staying out of sight and reside in deeper waters. Some of them even live at depths of more than 170 feet and like to hide near rocks or in reefs. They swim very slowly, and their bodies aren’t meant to swim long distances which is why they are experts at hiding, with their camouflage capabilities. Head to a location where there’s lots of structure underneath the water—think reefs, rocks, ledges etc.—as this is normally where they like to live. 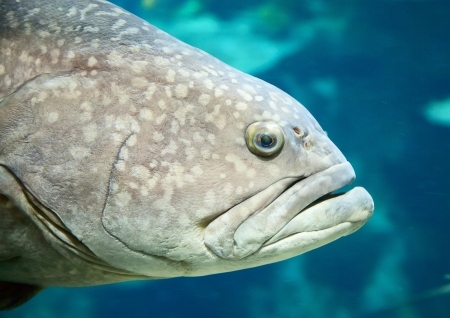 Because groupers are such heavy fish, they require heavy bait as well such as frozen squid or sardines. Groupers are one of the most delectable fish and are frequently served up by chefs because of their cloud-like texture. Ready to catch some of your own? Schedule a grouper fishing trip in Orange Beach aboard The Triple Trouble. We use selective baits and techniques in an effort to bring them in and get you your big (and delicious) catch. Give us a call at 256-431-5767 to schedule your charter today!